NEW YORK (CNNMoney.com) -- Google has quietly been stocking up on tools it will need to challenge Facebook in the social networking game, and says it's on the verge of launching a "social component" to a number of its core products. Over the past month, Google (GOOG, Fortune 500) has made five acquisitions in the field: SocialDeck, a mobile social gaming company; Angstro, a social networking search application; Like.com, a social fashion store; Jambool, a social gaming virtual currency; and Slide, a social game maker. 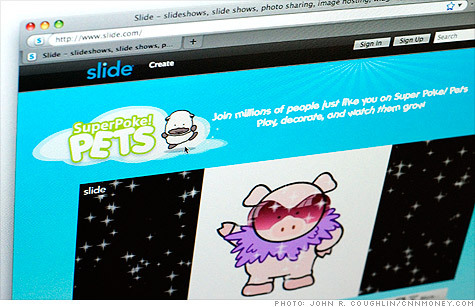 It also has a large stake in gaming giant Zynga. But before you start to arrange the puzzle pieces, analysts say don't bother. "Trying to predict how Google will put everything together using acquisitions is a fool's game," said Josh Bernoff, analyst at Forrester Research. "It's highly unlikely that the pieces will emerge into some form." Google has a habit of making acquisitions to buy up talent, not products. Bernoff believes many of the recent deals were done to pick the brains of the companies' engineers, who have experience with social networks. So what's all this for? After months of secrecy, Google finally began shedding light on its plans at last week's Zeitgeist conference in Arizona. Schmidt told reporters that Google would not be coming out with one new social network product. Instead, it plans to will unveil social networking tools that will be woven throughout its existing products and Web applications. It's the opposite of what Google has done -- and failed at -- in the past. Big social products like Orkut and Buzz have largely flopped, and Google's collaborative tool Wave was recently canned. It was the Microsoft approach: build big product after big product and hope that one eventually sticks. Google's new approach is more incremental -- which plays to the company's strengths. "Rather than bang its head against the wall trying to create a competitor to Facebook, Google appears to have come to the realization that all of its applications and assets have social aspects that can be extruded," said Al Hilwa, analyst for IDC. "It's more of a mall than a department store approach." It's a strategy that many companies -- including Facebook -- are starting to employ. "Social" on the Internet is not about a destination, but about the ability to discover, share and discuss content on the the Web with others. Social features are popping up in all kinds of applications, with Apple (AAPL, Fortune 500) adding "Ping" to iTunes and news publishers integrating Facebook's "Like" button throughout their sites. It's a crucial element that Google has been largely missing out on. With 178 million visitors to its sites in July, Google is the most-trafficked Web entity in the world and has 33 million more visitors per month than Facebook, according to comScore. But Facebook has been outpacing Google in referrals to portal sites (directing people to other websites' home pages) since February, according to Compete Inc. That's troubling for Google, since its business model relies on selling ads that direct traffic. Some Google products like Gmail and YouTube already incorporate elements of a social network, like status messages, instant messaging, commenting and media sharing. However, the social layer has eluded Google's largest product, search -- even though Google's PageRank algorithm is at its heart a social tool, factoring user behavior like linking into its results. Building richer social networking features into its offers could help Google better analyze users' preferences, and better target ads to them. But first, it will need to wrap its head around the social mindset -- something it's struggled with so far. Exhibit A: Buzz's troubled rollout. Stocking up on social media upstarts -- and the creators who built them -- could help Google fine-tune its approach. "If you imagine a very likely future when social is a part of everything you do online, the end goal will not be to create a single product or site to capture that," Bernoff said. "If Google can provide a social structure around its products, it's much more likely to maintain its relevance."